God holds us accountable for leadership in our families. How are you doing with it? How well equipped are you to lead, spiritually? God wants to reveal Himself to each of us. He has a plan for each of us that is rich and full. 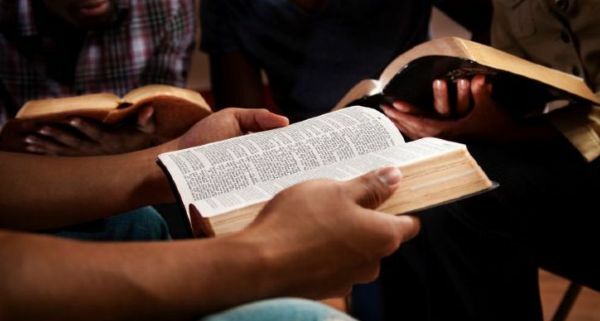 Bible Study Fellowship (BSF) is a rich, effective means to study God's word. I started attending BSF years ago as a sympathizer, not yet committed to Christ. As I studied, my questions and reservations were answered and it became clear that the Bible is God’s word to us and that Jesus is His Son, the only One able to reconcile us to Him. That reconciliation is His desire. All I had to do was trust Jesus and to ask for it. None of my training in physics, math, and engineering had anything to do with this. God’s plan is simple and direct. I trusted Jesus and He transformed my life. Over 30 years ago I made that step. Since then, as my life and relationship with God grew, I saw hundreds of men (and women) make the same commitment to follow Christ; on this continent and on others. I saw far more grow in their relationships with Him and in their service to Him. That’s simply what He does, with His word, when we cooperate with Him. The word of God truly is “sharper than any double-edged sword.” (Heb 4:12). When we study and apply Scripture, we enjoy fellowship with God, we serve as a light in our families, and we are a blessing to our community. But scripture is something we have to engage in, be actively involved in, and be seeking. At MCC we have a very active men’s BSF that meets weekly and includes men from a number of churches in the East Mountains. These are men from every walk of life, some with very little biblical background and some well-versed in scripture. All come hungry to grow in the knowledge of God and His Word. We meet in a small-group setting to discuss the daily lessons provided throughout the week. There is fellowship, investigation, manly support and accountability, as well as a communal lecture on the topic of the week. Let me personally invite you to study the Book of Romans with us through BSF. We’ll meet at the MCC Library at 6:55pm on Sept.12th to begin our 30-week study in Romans. For professionals, military, business travelers, or vacationers there are ways to participate in BSF where the Lord puts you worldwide during this year. If you are new to BSF, we will tell you about it. There is no cost and no pressure. Just come and see. There are other BSF opportunities, as well. A women’s group meets Thursday mornings in Edgewood. Additionally, there are men’s and women’s BSF groups in Albuquerque which provide age-appropriate biblical training for children. All studies will examine Romans at the same pace. It provides a great opportunity for husband and wife (as well as children) to study the same verses and discuss them at home during the week, drawing closer to each other as well as to God. For more information on transforming your life through BSF, call me (leave a message) or snag me at Church.